Product categories of Food Extruder, we are specialized manufacturers from China, Corn Flakes Extruding Line, Corn Flakes Production Line suppliers/factory, wholesale high-quality products of Core Filled Food Extruder R & D and manufacturing, we have the perfect after-sales service and technical support. Look forward to your cooperation! Food Extrusion is a form of extrusion used in food processing. It is a process by which a set of mixed ingredients are forced through an opening in a perforated plate or die with a design specific to the food, and is then cut to a specified size by blades. 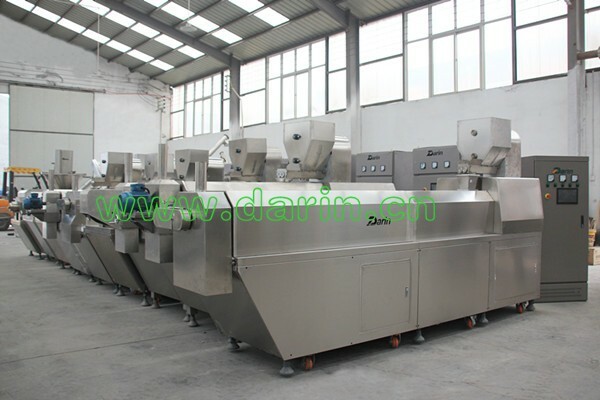 The machine which forces the mix through the die is an extruder, and the mix is known as the extrudate. The extruder consists of a large, rotating screw tightly fitting within a stationary barrel, at the end of which is the die. Extrusion enables mass production of food via a continuous, efficient system that ensures uniformity of the final product. Food products manufactured using extrusion usually have a high starch content. These include some pasta, breads (croutons, bread sticks, and flat breads), many breakfast cereals and ready-to-eat snacks, confectionery, pre-made cookie dough, some baby foods, full-fat soy, textured vegetable protein, some beverages, and dry and semi-moist pet foods. In the extrusion process, raw materials are first ground to the correct particle size, usually the consistency of coarse flour. The dry mix is passed through a pre-conditioner, in which other ingredients are added depending on the target product; these may be liquid sugar, fats, dyes, meats or water. Steam is injected to start the cooking process, and the preconditioned mix (extrudate) is then passed through an extruder. The extruder consists of a large, rotating screw tightly fitting within a stationary barrel, at the end of which is the die. The extruder's rotating screw forces the extrudate toward the die, through which it then passes. The amount of time the extrudate is in the extruder is the residence time. The first extruder was designed to manufacture sausages in the 1870s. Packaged dry pasta and breakfast cereals have been produced via extrusion since the 1930s, and the method was applied to pet food production in the 1950s. It has also been incorporated into kitchen appliances, such as meat grinders, herb grinders, coffee grinders, and some types of pasta makers. A similar functional process occurs when using pastry bags. Extrusion enables mass production of food via a continuous, efficient system that ensures uniformity of the final product. This is achieved by controlling various aspects of the extrusion process. It has also enabled the production of new processed food products and "revolutionized many conventional snack manufacturing processes". The extrusion process results in "chemical reactions that occur within the extruder barrel and at the die.